Ashlee Watts splits her time between research labs and clinical work at Texas A&M University as part of the large animal clinical sciences department. She spends what few hours are left in the evening after work riding her 9-year-old Danish Warmblood gelding, Hampton. 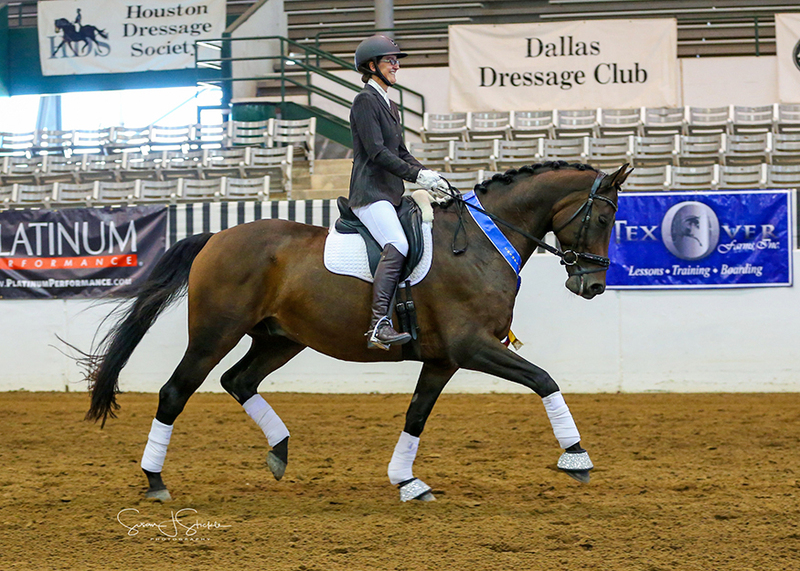 The pair from College Station, Texas, added victory in the second level adult amateur class at the Great American/USDF Region 9 Championships on Oct. 5-8 in Katy, Texas. COTH: Tell us Hampton’s story? Watts: I got him in 2015. He’d been imported two years earlier by his previous owner and I was actually treating him for a hind suspensory injury. He was about halfway through his rehab and I knew his owner was looking to sell him, and one thing just lead to another. COTH: Where do you keep him? Watts: I keep him at home. We have a little boarding stable that my husband runs so we have a broodmare and a bunch of babies as well. I haven’t been breeding long but I always wanted to; moving here in 2012 was just the first opportunity I had. COTH: How did you get into riding? Watts: I was born with a horse—my mom was a horse person and she owned a single horse I kind of inherited. First I showed western open stuff, then did hunters and jumpers, then I did Quarter Horse all-around for several years. I went to vet school and that interrupted any showing. During my residency I acquired a Thoroughbred I intended to start jumping, but he was terrified of other horses jumping. I’d always been interested in dressage so I started taking dressage lessons with him instead. I didn’t love the first lesson but I went back for a second and a third and pretty soon I was completely addicted. COTH: Why do you like dressage? Watts: I love the fact that the whole point is to make the horse a happier, healthier and better athlete. It’s all about education for the rider for a lifetime, which is in perfect alignment with my career as an academic veterinarian. I’m involved with teaching and research and trying to find ways to do things better, and I think dressage has a lot of that too. COTH: What do you specialize in as a veterinarian? Watts: I’m an orthopedic surgeon so I focus mostly on orthopedic and regenerative medicine. I try to understand how we can help the body get better at healing itself. We can get most things to heal in horses but we can’t get them to heal well enough that the horse is the same as it was before injury, so we’re always looking to improve that. COTH: What’s one of the most interesting things about your job? Watts: Probably the collaboration I get to do, both with equine professionals and human doctors. Horses and humans are actually really good models for each other because they’re both athletes and they get very similar injuries. I have collaborators who are human researchers; we actually just published a paper on tendon injury and improving tendon healing, and that idea is something that will go into both human and veterinary medicine. Sometimes the human doctors think it’s a little strange, but my goal is to fix the horse and their goal is to fix the human and together we come up with something really cool. COTH: Do you like one aspect of your job better than the other? Watts: One makes me excited about the other. If I was only doing one I’d get really bored. The clinical work makes me really excited about getting into the lab and figuring things out, and the research makes me really excited about going out and doing the clinical work. COTH: How has your horse developed over the years? Watts: This is our third year winning at regionals. We were first in training in 2015 and at first level last year and Hampton has become such a show horse. The first time we went to the [USEF National Championships] in Kentucky he was terrified. He was so spooky and really just overwhelmed. Now I can take him to a new venue and he’ll be a little spooky but as soon as we go down centerline he’s like, “I’ve got it.” He’s grown tremendously. I ride six days a week at home; now that he’s a little more reliable I don’t feel I have to ride him every day. COTH: What are your goals for the future? Watts: Goals long-term are to go FEI, or go as far as we both can. Goals for next year are fourth level and learning to ride in a double bridle. Like this story? We’re featuring lots of GAIG/USEF Regional winners on www.coth.com—including a neurosurgeon amateur’s bittersweet win, how North Forks Cardi helped his amateur rider overcome nerves, and more. Read about them all!